I’d just like to start by saying – the moth book is done! Done! I took it to the post office and mailed it off today, with much excitement (the clerk, whom I asked to take a photo as I pretended to put it in the mail slot, didn’t quite appreciate my excitement, I don’t think). Of course, the book’s not completely done. There’re many more steps yet to go even once the initial manuscript is prepared and finished – a fact that I didn’t truly appreciate until I was doing a book of my own. Once our editor gets the files I sent her, she still has to edit all our text, we need to make any revisions as required, then the contents go on to layout, come back to us for proofing (the trademark Peterson arrows get put in at this stage), and go back for final revisions, before ever a copy gets printed. Actually being involved in the production of a book has been rather enlightening, not least of all in the amount of time it takes to get a book from idea to store shelf. It’ll have been about four years, in our case. So life finally returns to normal for me. For the last, oh, three months or so, I’ve been buckled down and focused on completing the moth manuscript. A lot of things have fallen by the wayside, and I’m looking forward to getting back to all those things I’ve been missing. Like the blog! I’ve had these photos since last week, fully intending to post them shortly after taking them (I’d also been expecting to wrap up the book before the Thanksgiving weekend). Over dinner one evening last week, Dan asked if I’d noticed the interesting mushrooms growing down near our little bog/fen. I’d been down that way a couple of times in the preceding days, but hadn’t gone in too far, and hadn’t noticed any odd fungi in the part that I had traversed. He commented that they were just the other side, a whole patch of them, thin little dark things sticking up from the moss. I said I’d check them out the next time I went out. In the meantime, I brought down my field guide to fungi for him to look through and see if he recognized them. 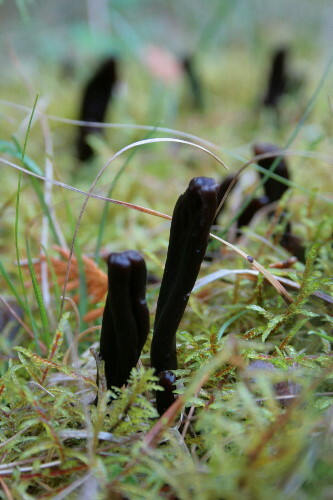 The method of dispersal also depends on the species, but earth tongues share the same general mechanism as morels. 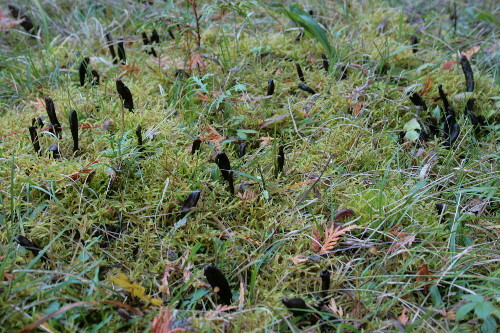 The type of fruitbody is called an apothecium, and the sacs of spores are layered on its outside surface. Immature spores are pigmentless, but mature spores develop pigment to protect them from UV while they are airborne. When the spores are mature, the sac bursts, projecting them into the air for the wind to catch and disperse. Apparently with some species, if you blow gently on the mushroom when the spores are ripe you can trigger the sacs into bursting, releasing puffs of “dust”. I didn’t try it on these ones, in part because I didn’t know to, but even if I had they were damp and tacky and probably wouldn’t have been releasing any dust anyway. 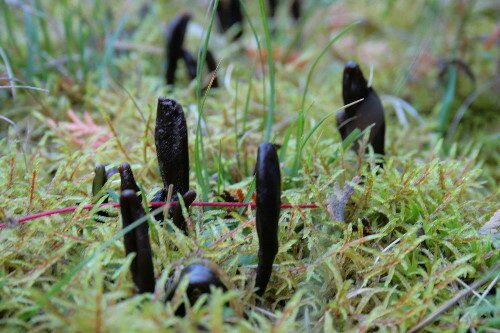 They were all growing in a small patch of sphagnum moss, a short distance from the edge of the bog/fen. From the way they were distributed it looked as though they had an association with the moss, but I suspect it more likely that the moss simply kept the ground there nicely damp compared to the surrounding dirt; there’s no mention of moss in the guide. Congratulations, Seabrooke, on completing the book. Congratulations on finishing your moth guide! Earth tongues is a neat name. Congratulations on reaching this milestone! Look forward to the book when it comes out and happy to have you back and blogging! Oh, happy day, congratulations on coming this far with the book! I have a sudden hankering for licorice. Congratulations on getting you book off to the publisher! Thanks for the congratulations, everyone! I’m pleased and excited to be done and moving on to the next stage of things with the book. One step closer to having it on store shelves! Congrats to you on your Moth book..May it do very well! Those moth tongues are very cool.. Thanks, Dawn! I hope it’ll be well-received.